My boyfriend flew to Fairbanks, Alaska yesterday because he has some time off work and has flight benefits through his job. He also has a shiny new camera and lenses and really really wanted to take some pictures of the aurora (he's a good amateur photographer - you can see some of his pictures of the Perseids here). Him: Well, I'd better sign off so that I can go grab a bite to eat. 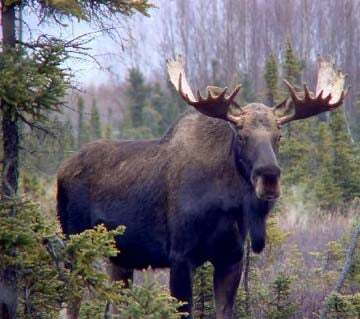 Me: Are you going to have moose testicles? Me: I think this is a reasonable question. You've eaten bull testicles before. Him: NO, I'm not having moose testicles. Me: You might not get another chance. And you're in Alaska. Him: While I'm hungry, I'm not THAT hungry. Me: Okay, it was just a suggestion. Him: I've got to go. Everything closes early here and the hotel restaurant is really pricey. Me: Okay, talk to you later. Him: I think there's a random Italian place down the road. Me: Do they serve moose testicles? That's when he ended the conversation.